Sennheiser LSP 500 PRO On-Board with AIDA: Lines Away! The entertainment program on the AIDA ships changes every day and therefore a very flexible, fast to set up PA System with high audio quality was needed. The Sennheiser LSP 500 PRO wireless PA speaker was recommended to AIDA. With a built-in mixer and rechargeable battery, LSP 500 Pro allowed complete flexibility to the cruise line to bring the audio wherever required on the ship. "Set it up, switch it on, and you're done. The Sennheiser LSP 500 PRO is the perfect solution for the new show concept on board the AIDA ships!" Starting in fall 2014, the seven largest ships in the AIDA fleet have gradually been fitted with the LSP 500 PRO. 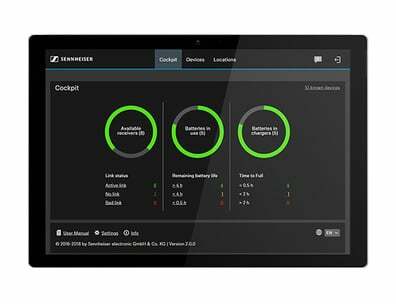 Each ship has two of the flexible Sennheiser systems in use. Profile AIDA Cruises is a German cruise line based in Rostock, Germany. They currently operate 11 cruise ships and will grow in the future. The entertainment program that takes its audience into fantastical worlds on board the AIDA ships changes on a daily basis. The spectacular shows are created especially for AIDA and performed by professional artists – AIDA cruises recently won the Deutsche Kreuzfahrtpreis (German Cruise Line Award) 2015 in the “Best Entertainment Program” category. The main event venues on the AIDA ships equipped with Sennheiser technology are the “Theatrium” and the pool deck stage, which are both fitted with fixed PA systems. Thanks to the newly acquired LSP 500 PRO, all the other locations on board can be used for smaller and medium-sized events when required – which is exactly what the AIDA entertainment concept envisions. The multi-functional Sennheiser systems are primarily used to reproduce speech (during readings, for instance). The artists can work with handheld or bodypack transmitters, depending on their preference. The bodypack transmitters are combined with tried-and-trusted Sennheiser HSP 4 capacitor headband microphones. Pre-recorded music tracks are reproduced in the best sound quality with the Sennheiser LSP 500 PRO – one extremely practical option is simply to connect a USB stick in the port with the same name on the rear side of the housing and play back the audio files using the integrated media player. The capacitances of the rechargeable batteries for autonomously operating the LSP 500 PRO are more than sufficient for the typical entertainment applications on the AIDA ships. External chargers are provided to charge the LBA 500 system batteries. 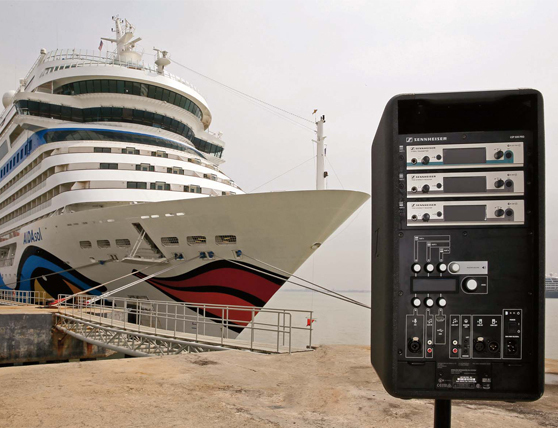 Sennheiser products have been deployed on board AIDA ships for many years now, and radio links from the product range of the renowned audio specialists have proven themselves in applications on each of the world's seven oceans. The radio links needed to operate the LSP 500 PRO can be integrated into the existing frequency grid with ease. Robust LAP 500 fabric covers made from high-quality nylon are available to protect the LSP 500 PRO during outdoor use.